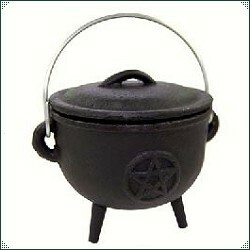 In Wicca the Cauldron - symbolically the womb of the Goddess and as a symbol of transformation. A versatile tool to place offerings to the gods of old within it, brew potions, burn candles and paper spells. They have also been used by Witches as tools of divination and scrying and containers for sacred fires and incense. Often dedicated to the Goddess Ceridwen, and associated with water and the west. The Dagda's Cauldron, a large cooking pot which never emptied and which left none hungry, is one of the four legendary treasures of Ireland. In Irish mythology the Tuatha Dé Danaan (peoples of the goddess Danu) brought with them a treasure from each city – from Murias came The Dagda’s Cauldron, known as Undry. The Gundestrup cauldron is a richly-decorated silver vessel, thought to date to the 1st century BC. It was found in 1891 in a peat bog near the hamlet of Gundestrup, Denmark. It is now housed at the National Museum of Denmark in Copenhagen. 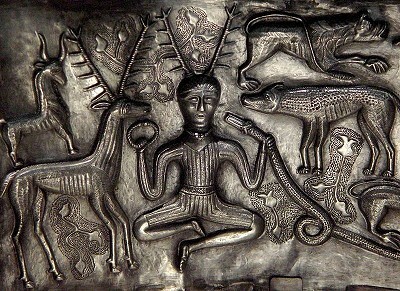 The Gundestrup cauldron is the largest known example of European Iron Age silver work (diameter 69 cm, height 42 cm). The style and workmanship suggest Thracian origin, while the imagery seems Celtic.